First we practiced the broad jump. Dad got this good picture of Mom and me. Don't I look like a white-tailed deer? Dad also took this picture of me jumping. I'm so fast, even the camera can't catch me! Next we went on to the chute. Here's a good picture of me just peeking out of the end of the chute! Dad didn't get a video of me doing the chute. Next it was time for the dog walk. I love the dog walk. 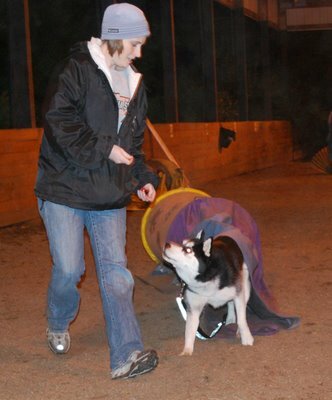 The teachers had the dog walk at a lower height since we are beginners, but I love to run fast on it! After the dog walk, we went to the weave poles. Right now, we are just running though the middle of the poles and every class, the teachers move the poles closer and closer together. 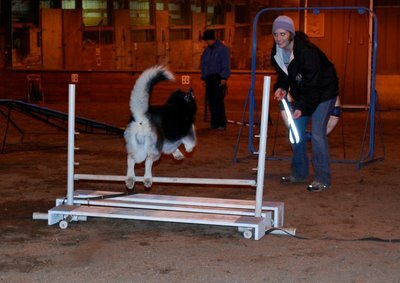 We practiced the weave poles a bit by themselves, then we added a jump and the tunnel onto the end. The tunnel is my favorite! Then the teacher decided to make it a bit harder and we had to do the jump and weaves again after the tunnel. After that combo, we did a combo of the broad jump, a regular jump and the tire. At this point, class was over, but I still wanted to show Dad how I can do some of the other obstacles. Here I am doing the A-frame. 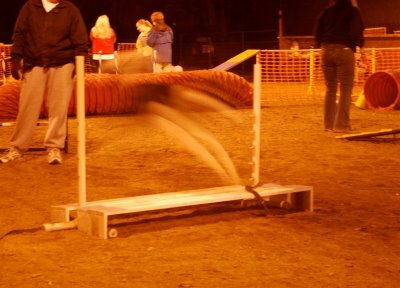 I hope you enjoyed watching my agility class. It like you all were there too! Dad said he would come again to the last day of Advanced Beginners class so he can take pictures of the new things I have learned.